One of the sections of the Geography Curriculum that your child will be studying is knowledge and understanding of environmental change. Throughout the four key stages of a child’s education they will learn to identify and explain ways in which people both damage and improve the environment, identify changes to the environment and a range of environmental issues, and learn how these environmental issues are managed. Children learn to become mindful of change in their own surroundings, e.g., transitions in the classroom, playground, and the times of year. Their education advances to learning about how people affect the environment, for instance how they damage it, and how the environment can be improved or managed now, and in the future. At home, there are many ways that we can teach our children to be environmentally responsible. Our children are the adults of the future, and they need to learn the skills that will help them to continue caring for the environment. The first and most important way to help your child to learn to be environmentally responsible is to set a good example. If you demonstrate to your child that it is wrong to litter, ensure you recycle as much as possible, make use of environmentally friendly products in the home, and dispose of harmful waste in the correct manner, you will find your child will start to imitate your positive actions. Point out both good and bad environmental practices when you see them and discuss with your child why the practices are either good or bad. Do what is right with regard to the environment and your child will follow. Encourage your child to get involved when you are participating in environmental conservation. Environmental projects and hands on activities can help to reinforce the concepts taught in school and are a great way for you to spend time together, as well as teaching your child something of value that will benefit them for years to come. If possible, go on a nature walk with your child. Discuss what you see; plants, animals, trees and how all these can be damaged by people and their actions. Discuss what is the right thing to do and how the environment can be improved. 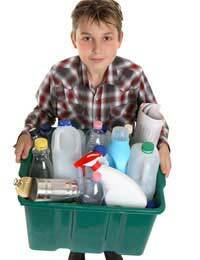 Let your child get involved with recycling items. When they are finished with packaging discuss whether or not it is recyclable and ensure that your child knows what to do with it. Create a simple environmental project that you can do together. Something as simple as designing a poster demonstrating environmental ethics and including a slogan, or doing a written project where they can do research in books or on the internet is a great way of learning and having fun at the same time. Helping your child to learn about this part of the curriculum can contribute to improving and sustaining the environment, and can help them to become aware of and to recognise changes in their environment and what can be done about those changes. They will learn the most by observing those around them such as their parents, teachers and friends. Reinforcing classroom education at home and combining it with observation and practice is the best way to teach your child their role in the sustaining of the environment and the steps they can take to make a difference.